6 × 3 = Required Please enter the correct value. Investing in Bitcoin hasn't been for the faint of heart, but over the long run it has delivered virtually unmatched returns. In fact, you could have booked an annual return of nearly 82% each of the last three years. Gauging Bitcoin as an investment hasn't been easy. Part of that is because as a digital currency it doesn't have a physical existence, which makes a lot of folks nervous. But mostly it's because of Bitcoin's infamous volatility. Even casual observers remember the fall of 2013, when the Bitcoin price soared from about $100 to more than $1,200. A little more than a year later, the price of Bitcoin was below $200. While it never completely disappeared, Bitcoin's volatility returned with a vengeance over the past month or so. From about $450 on May 24, the price of Bitcoin rocketed as high as $775 before plunging to lows of about $560 on June 23. The stunning Brexit vote last week caused another spike in the Bitcoin price, up to about $680, as the digital currency gained traction as a safe-haven investment. This week, Bitcoin has settled into the $650 range — although the odds are it won't stay there for long. Volatile returns like these are the reason a financial tool called the "compound annual growth rate," or CAGR, was created. The CAGR is a calculation that tells you what the annual return on any given investment would have been had that return remained at one steady rate. It's a "big-picture" number that provides a better idea of the value of an investment over long periods. Stocks? The CAGR for the Standard & Poor's 500 index over the past three years is just under 8%. Not bad, but a fraction of Bitcoin's. Real estate? The three-year CAGR for the U.S. existing home median sales price is 5.68%. Gold? The CAGR for the SPDR Gold Trust (NYSE Arca: GLD), the exchange-traded fund based on the price of gold, is just 1.65% — even with the recent Brexit-driven spike. Clearly, no investment class comes close to Bitcoin. What about individual stocks? Surely a lot of stocks beat investing in Bitcoin, right? Not quite. Out of the approximately 6,000 stocks that trade on the major U.S. exchanges, only 13 have three-year CAGRs higher than Bitcoin's. 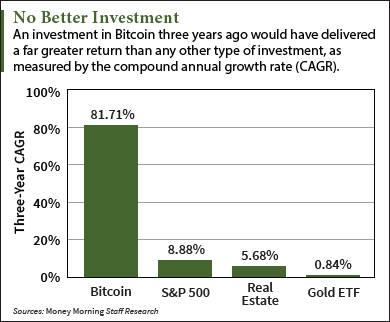 While it would not be smart to put all of your money into Bitcoin (or any one investment), anything that can deliver a CAGR of more than 80% over three years makes a strong case for a 2% to 5% chunk of your portfolio. Of course, past performance is no guarantee of future results, as they say. Bitcoin price predictions with a short time horizon don't really work with CAGR, so we can't use those. That includes Gyft founder Vinny Lingham's prediction that Bitcoin will reach $1,000 by the end of this year. Instead we have two long-term predictions from Wall Street analyst firms Wedbush Securities and Needham & Co. The Needham forecast is for Bitcoin to hit $1,896 by 2020. Again, I'm using $600 as the present Bitcoin price to balance the recent volatility. If Bitcoin indeed reaches that price in four years, the CAGR is 33.33%. While not as impressive as 82%, that CAGR will almost definitely beat virtually any other investment class. The Wedbush prediction is a bit more interesting, as it moves further out in time to 2025 and projects a Bitcoin price of $17,473. That forecast translates to a Bitcoin CAGR of 45.44% over nine years. To be clear, that's an implied return of 45% every year for nine years straight. I can't imagine any other investment providing such a dramatic return over that kind of time span. And while Bitcoin is still riskier than most other types of investments, that risk is declining. What once was the province of computer geeks and libertarians now has the full attention of venture capitalists and all of the world's major banks.